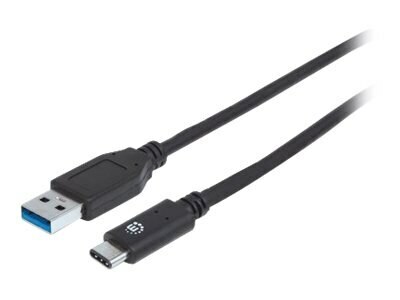 Manhattan SuperSpeed+ USB Type C to USB Type A M M Device Cable, Black, 20"
Manhattan SuperSpeed USB Type-C Cables easily connect USB Type-A peripherals and accessories to Type-C device ports. Ideal for use with any USB Type-A plug-and-play device, these cables support data transfer rates of up to 10 Gbps on Windows and Mac systems for fast, reliable transmissions and current of up to 3 amps. Nickel-plated contacts, shielding and fully molded boots with strain relief provide dependable connections, maximum conductivity and minimal data loss with reduced EMI interference.